"Andy, I will sing your praises. Your Energy booster has galvanized this MZ 125. Dave's eyebrows went up and they are nailed down usually! Mid range is up and hill climbing is a giggle. Downside is I've got to watch the speed limits. You can quote me if you want - the damn thing's brilliant! an East German commuter but 'Ignition by PAZON' or some such would be impressive." 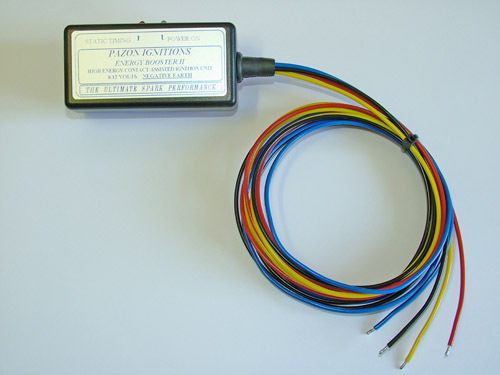 Contact (points) assisted ignition unit for classic/high mileage cars/motorcycles, 6 or 12 volts & negative earth electrics. Unit features power & static timing lights. Compact, black unit with 1 metre long leads. Stops burning of the points. Offers stronger & more consistent sparking. Eliminates the need for the condenser. Twin/four cylinder motorcycles with two sets of points will require two units.